Our members newsletter is sent out monthly to all CCT members and associate members. 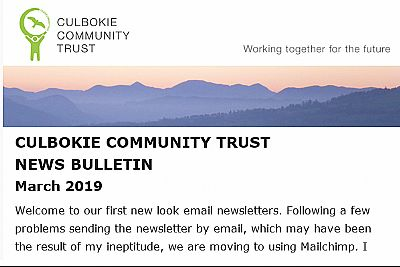 Our thanks go to Cindy Reeves for helping us to create a new look and to make the newsletter much more professional by allowing us to embed images into the news stories. The screenshot below gives you a little preview. To join CCT and receive our newsletter, go to the Support Us section and find a membership form. Membership is free. 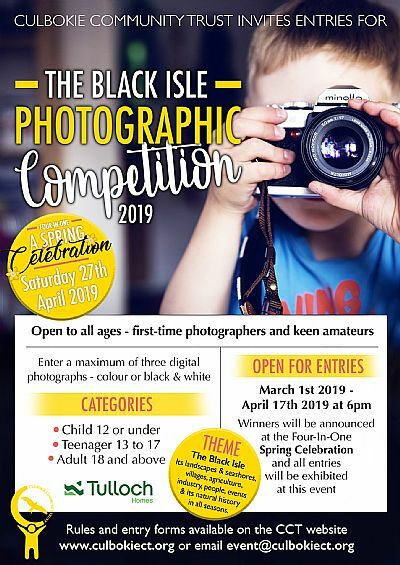 The Spring Celebration event will take place from 3.00 to 6.00pm on Saturday April 27th, offering four highlights: the display of all entries to the Black Isle Photographic Competition, live flute music by Mike and Babs Crocker, a Silent Auction and a luxury cream tea. To help us with our planning, tickets for the cream tea will be available from the Spar shop or from event@culbokiect.org. If supplies allow, there will also be an opportunity to buy a cream tea on the day. However, we would strongly advise buying or reserving your cream tea tickets in advance. Entry to the exhibition is £2 on the door. All welcome. We're delighted to share the photographs that were taken by Martin Sherring and Julie Shortreed at the Rabbie Burns Special event in January. Thank you all for being so generous in giving us permission to use them. Well done to all the teams who took part in the Rabbie Burns Special Orienteering event. Here are the results if you want to find out how your team did. During September and early October 2018 we are consulting on our ideas for the public open space that makes up part of the Culbokie Community Hub project. Read our report on what you said in the consulation and our responses. 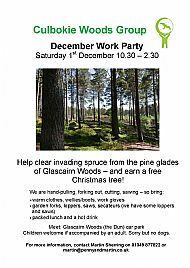 Help clear invading spruce from the pine glades in Glascairn Woods and earn yourself a free Christmas tree. An inaugural community orienteering event was held on Saturday 25th August. The emphasis was on having fun and taking part rather than winning. 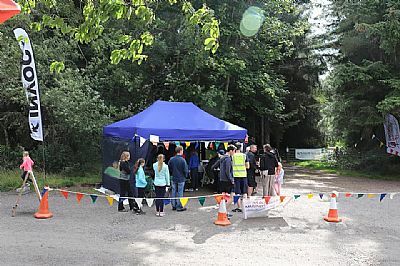 This was an event for families, young people and groups - in fact anyone who wants to enjoy the outdoors, try some navigation and meet up with others in the community - with a little gentle competition thrown in. Thank you and well done to everyone who came along to our 'Come and Try It' Orienteering Event. We hope you all had lots of fun. Read our report (Word docx) about the event and view the final results (PDF). A selection of photos are available on our Orienteering page. All locals are invited to take part in the Culbokie Challenge in May/June 2018, to help raise money for the Culbokie Community Hub at Glascairn. YOU decide what your challenge will be. 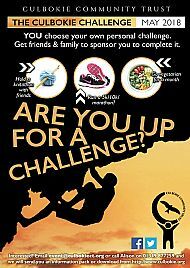 You get friends and family, from far and wide, to sponsor you to complete it. Your challenge can be anything you want; it’s best if it is something that you’ll feel good about doing and will enjoy doing. You can do it on your own or in a team, with friends or family. 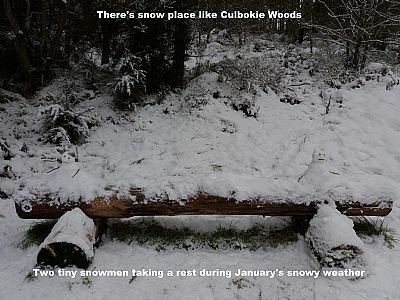 Find out more about The Culbokie Challenge 2018. 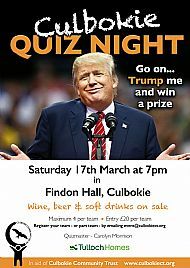 Come along to a fun fundraising evening and raise money for Culbokie Community Trust. Wine, beer and soft drinks on sale. Maximum 4 per team, £20 per team. Prizes for winning teams. 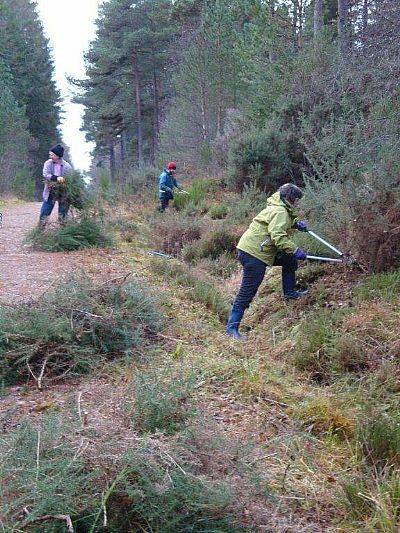 It was a fine sunny day for the work party, and eight volunteers turned out to do their bit to keep the paths in the woods open and help improve them for wildlife. 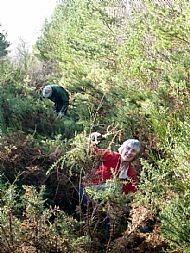 At the previous work party, in December, we had made a valiant effort to clear the gorse-choked track from the cross-roads in the woods, to the north side of the loch – now known for evermore as “Gorse Alley”. Even though we made a good start, we ran out of time then, so this time we were keen to finish the job. The track into the woods from Greenleonachs, although easily passable, was also getting overgrown. So, we split the group between the two jobs. 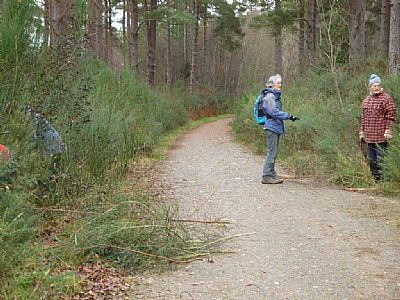 We made good early progress on the Greenleonachs track (which, incidentally, is now part of the John O’Groats trail long distance path from Inverness to John O’Groats), but Gorse Alley was another kettle of fish. So, after a break for elevenses and a blether, we focussed on the gorse. As time ticked away and the end of the path hardly seemed any closer, conversation dried up and the loppers flashed! And the end result – just finished in time – is a new route for folk to explore. It’s still a little bit narrow in places, but it opens up two circular routes. 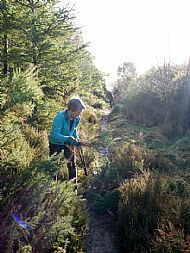 To explore the northern bank of the loch, turn left at the far end of the newly-cleared track – but watch your feet, it’s a bit boggy in places. Alternatively, turn right and follow a good path to come out on the main forestry road close to the recycling car park. Do use them, otherwise they’ll get overgrown again in no time! Thanks to the volunteers – and watch out for the next work party. 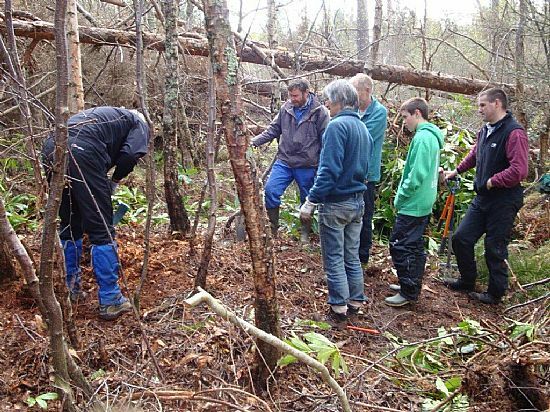 On a pleasant Saturday morning, 17 adults and children started to clear three paths in the woods. The before and after photos show the main track going towards the village from the crossroads - what a difference! The new John O'Groats Way runs through Culbokie Woods from the entrance at Greenleonachs to the recycling car park. 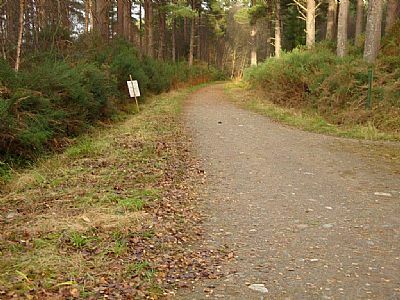 This route through the woods is also marked as a cycle route on the Black Isle Active Travel Map so work was started to ensure that the vegetation is kept back from the path at the Greenleonachs entrance. The third path was a challenge! This was the old track going SW from the crossroads and it has been totally blocked for a few years. It has now been opened up for about half of its length and will hopefully be completed during another work party early in 2018. 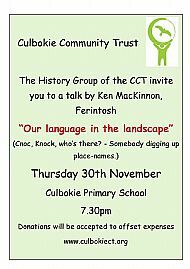 The History Group invite you to a talk by Ken MacKinnon of Ferintosh. Saturday, 18th November 2018, 7.30PM at Findon Hall. 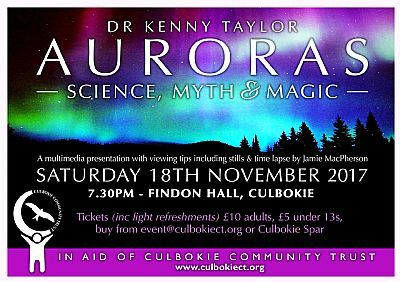 Auroras: Science, Myth & Magic, with Dr Kenny Taylor. a multimedia presentation with viewing tips including stills and time lapse photography by Jamie MacPherson. Tickets £10, £5 for under 13s. Light refreshments included. 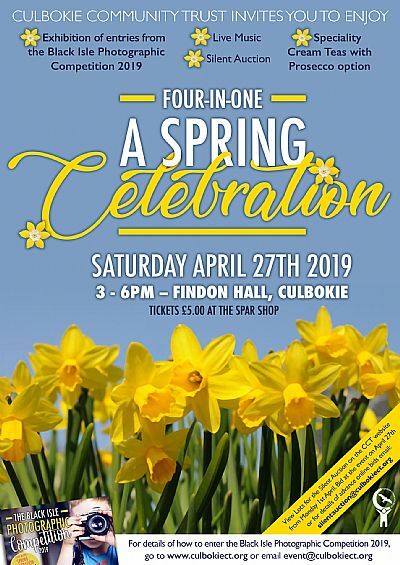 Tickets from event@culbokiect.org or Culbokie Spar. 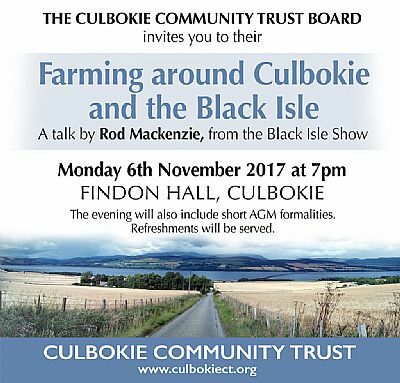 Culbokie Community Trust invites you to their AGM with special guest Rod Mackenzie (Black Isle Show). All welcome, refreshments served. Another fully booked event! In fact, overbooked, so we hope to run another event in February or March next year. Fifteen people had an informative talk about badgers from Dave Walsh before walking to a local sett for a short visit. 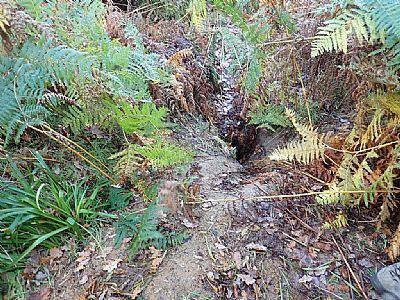 Despite there still being a covering of bracken several entrance holes were visible, each with a spoil heap from the badger's excavations. Dave is interested in setting up a Scottish Badgers surveying group on the Black Isle and would like to hear from anyone who can spare some time (mainly in the winter months) to help and learn more about these animals. He would also be pleased to hear from anyone who already knows of badger setts, or who see badgers regularly. If you are interested please email Dave. 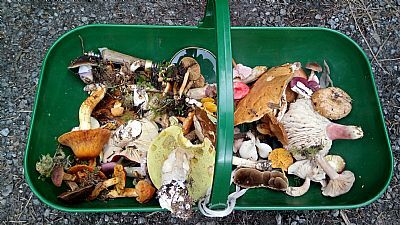 A full complement of eighteen people set off into Culbokie Woods for a Fungal Foray, with fungi expert Liz Holden. We didn’t have to go far to find loads of beautiful and colourful species and we were shown what features to look for when trying to identify them. The highlight of the morning was the discovery of the extremely rare ‘golden navel’ on a fallen spruce trunk. We were over-the-moon when the internationally best-selling author Ian Rankin agreed to support the Trust with a fundraising event, ‘An Evening with Ian Rankin’ - and who better to lead the conversation than Inverness’s own Nicola McAlley? 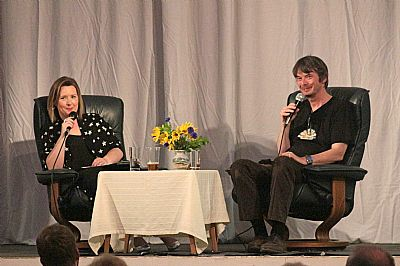 The event took place in Culbokie’s Findon Hall which was filled to capacity with Ian Rankin enthusiasts from the local a rea. The audience were regaled with tales of Ian’s early life as a struggling young writer, his relationship with Rebus, his thoughts on Scottish crime writing today and insights on how his own emotional life is sometimes reflected in his work. As a nod to Rebus, the Cromarty Brewing Company provided free beer for everyone and the chance to try their wide range of beers. 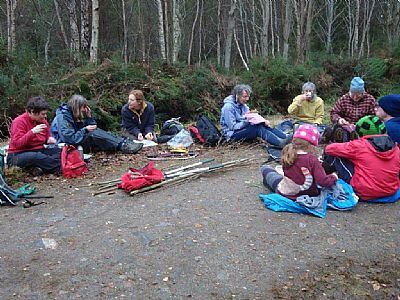 All the children's bushcraft sessions were well attended with children not only coming from Culbokie but also from the wider Black Isle and beyond. Ian Paterson, from Go Wild Highlands, had a wide range of activities over the four days to keep the children interested. 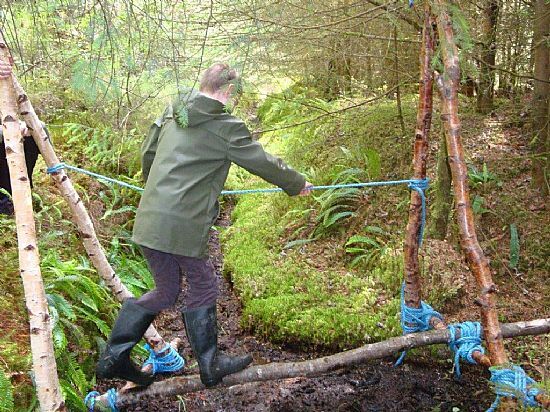 They made shelters, used a fire steel to make fire, tied knots to make a stretcher and a bridge, made charcoal, solved animal crime scenes and made twine from nettles. 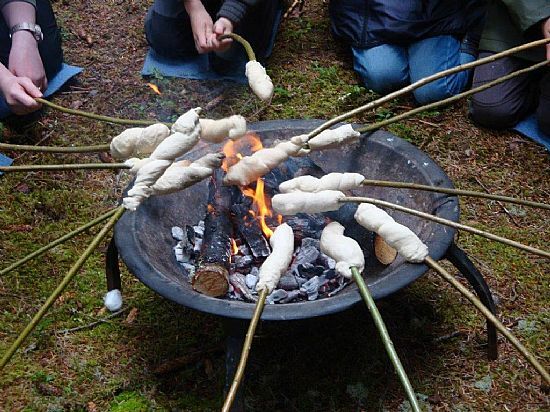 The most popular activity, however, was probably cooking 'bread' and marshmallows over the fire! 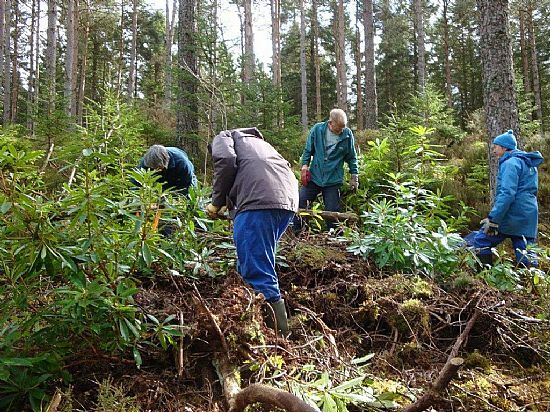 The rain early in the day stopped just in time for a work party of eight who tackled the removal of rhododendron in Culbokie woods. Three areas were cut down and as much as possible of the roots removed, with many seedlings at one area also being pulled up. If allowed to grow unchecked rhododendron will take over native habitats, spreading by seeding and by layering to create a dense, dark canopy that stops anything growing underneath. Pleasant weather brought a turnout of about 25 adults and children to our annual Christmas Work Party. The verges near the bench on the bend of the main track were cleared to allow flowers and grasses to flourish in a sunny area known for butterflies and dragonflies. The path, originally a track, which goes north-east from the bench and had become very overgrown and unpleasant to walk along was also cleared. 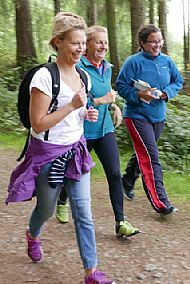 It is now open, giving good access and a better experience for walkers and joggers. 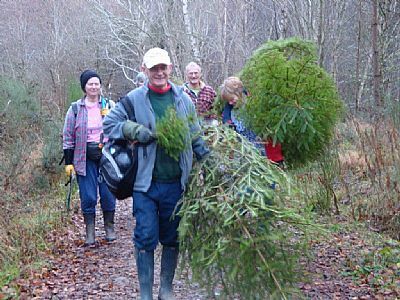 Trees for Christmas were taken home by many of the workers after a successful few hours work.